Near-record housing activity this year has translated into exponential mortgage growth while consumer credit grinds to a halt. Residential mortgage borrowing is expected to continue to increase, while other credit sources “tap the breaks,” according to RBC Economics. Industry players will also likely find the slowing of consumer credit encouraging, as it points to more prudent financial habits forming among Canadians. The low rate environment is certainly drawing clients to the market, and that trend is expected to continue, meaning many brokers may be in store for a record year. Non-mortgage borrowing slowed to 2.9% last month, according to the bank. 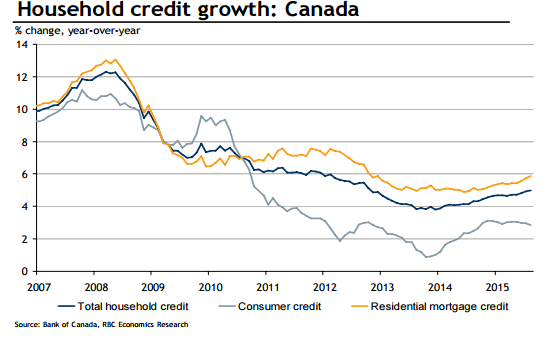 To get a glimpse of overall credit growth in Canada, see the chart below.